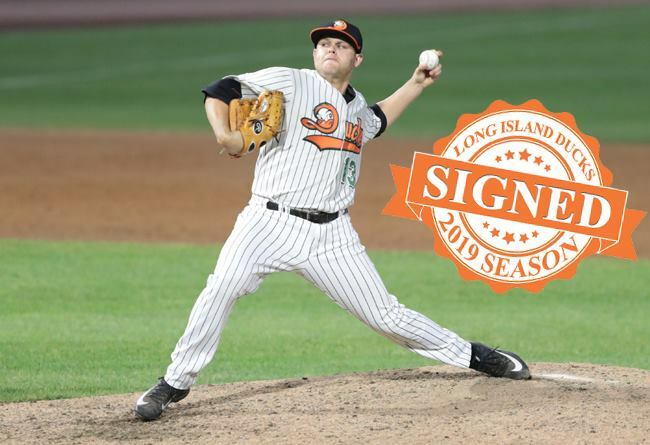 (Central Islip, N.Y., March 12, 2019) – The Long Island Ducks today announced the signing of left-handed pitcher Jake Fisher. The starter enters his third season with Long Island and seventh in professional baseball. Fisher turned in a strong season in 2018, his first full year with the Ducks. He ranked fourth in the Atlantic League for both strikeouts (107) and innings pitched (133.1) during the year while posting the eighth-best ERA in the league (3.92). The Oklahoma native went 8-7 over 21 starts and recorded a pair of complete games. Fisher walked just 25 batters all year, recording 1.7 walks per nine innings and a 4.28 strikeouts-to-walks ratio. For his efforts, he was selected to play in the Atlantic League All-Star Game, held at Bethpage Ballpark on Long Island. Fisher started three postseason games as well, compiling a 1-1 record with a 2.89 ERA and 13 strikeouts over 18.2 innings of work. The 28-year-old first joined the Ducks via trade from the Windy City Thunderbolts of the Frontier League in September of 2017. He yielded just four runs over 13 innings in two regular season starts before going 1-1 with a 3.30 ERA and 15 strikeouts in two playoff starts. Included was a complete game, nine-strikeout performance to defeat the Somerset Patriots in Game Three of the Liberty Division Championship Series. The University of Oklahoma alumnus pitched for four seasons with the Thunderbolts, combining to go 29-28 with a 4.08 ERA and 412 strikeouts over 77 games (74 starts). Fisher was originally selected by the Los Angeles Dodgers in the 22nd round of the 2013 amateur draft. The Long Island Ducks are members of the Atlantic League of Professional Baseball and play their home games at Bethpage Ballpark. For further information, call (631) 940-DUCK or visit www.liducks.com. © 2019 Atlantic League. All rights reserved.